Anne's ancestry can be seen on her father Allen Perley page. Betsey's ancestry can be seen on her father Josiah Conant's page. Sylvia was the daughter of Joseph Rich and Meriah Powers. Sylvia also married Ira Canterbury. 1. GEORGE WASHINGTON4 DAVIS (SILAS3, ELEAZER2, ELEAZER1) was born 02 Jan 1791 in Templeton MA, and died 22 Jul 1857 in Gardner MA. He married (1) ANNE PERLEY 10 Jun 1813 in int Gardner MA, daughter of ALLEN PERLEY and LYDIA PROCTOR. She was born 19 Aug 1795 in Gardner MA, and died 10 Dec 1821 in Gardner MA. He married (2) BETSEY CONANT 24 Nov 1822 in Gardner MA, daughter of JOSIAH CONANT and ANNES DARBY. She was born 08 Apr 1791 in Gardner MA, and died 21 Oct 1837 in Gardner MA. He married (3) SYLVIA RICH 08 Jun 1840 in Gardner MA, daughter of JOSEPH RICH and MERIAH POWERS. She was born 29 Mar 1798 in Phillipston MA, and died Aft. 1865.
i. WALTER5 DAVIS, b. 18 Nov 1813, Gardner MA. ii. GEORGE DAVIS, b. 17 Nov 1815, Gardner MA. 2. iii. ALONZO DAVIS, b. 15 Nov 1817, Gardner MA; d. 23 May 1888, Fitchburg MA. 3. iv. BETSY DAVIS, b. 13 Oct 1821, Gardner MA; d. 22 Apr 1883, Gardner MA. v. LYMAN5 DAVIS, b. 23 Nov 1824, Gardner MA; d. 05 Oct 1846, Gardner MA. 4. vi. LEANDER DAVIS, b. 29 Jun 1826, Gardner MA; d. 01 Nov 1896, Orange MA. 5. vii. ANNA PERLEY DAVIS, b. 25 Sep 1827, Gardner MA; d. 27 Jul 1903, East Providence RI. viii. MARIA A DAVIS, b. 30 Mar 1829, Gardner MA; d. 06 Feb 1860, Gardner MA. ix. LUCY ANN DAVIS, b. 05 Jun 1830, Gardner MA; d. 27 Jan 1858, Worcester MA. x. SILAS DAVIS, b. 01 Jan 1832, Gardner MA; d. 19 Apr 1842, Gardner MA. xi. CHARLES DAVIS, b. 13 Jul 1834, Gardner MA; d. Aft. 1850. 2. ALONZO5 DAVIS (GEORGE WASHINGTON4, SILAS3, ELEAZER2, ELEAZER1) was born 15 Nov 1817 in Gardner MA, and died 23 May 1888 in Fitchburg MA. He married (1) BETSY TAMESON JACKSON 21 May 1845 in Gardner MA, daughter of ISAAC JACKSON and BETSEY BROOKS. She was born 22 Aug 1822 in Gardner MA, and died 03 Jan 1847 in Fitchburg MA. He married (2) MARY S BUTTRICK 06 Dec 1859 in Fitchburg MA, daughter of FRANCIS BUTTRICK and MARY BIRD. She was born Abt. 1839 in Sterling MA, and died 16 Oct 1907 in Fitchburg MA. 6. i. WALTER ALONZO6 DAVIS, b. 13 Jul 1846, Fitchburg MA; d. Aft. 1920. 3. BETSY5 DAVIS (GEORGE WASHINGTON4, SILAS3, ELEAZER2, ELEAZER1) was born 13 Oct 1821 in Gardner MA, and died 22 Apr 1883 in Gardner MA. She married JOSEPH HALE COOLIDGE 29 Apr 1847 in Gardner MA, son of JOSEPH COOLIDGE and ACHSA HALE. He was born 28 Feb 1818 in Gardner MA, and died 26 Mar 1859 in Gardner MA. 7. i. HENRY ALONZO6 COOLIDGE, b. 24 Oct 1848, Gardner MA; d. Aft. 1930.
ii. GEORGE HERBERT COOLIDGE, b. 21 Jun 1850, Gardner MA; d. 25 Jun 1852, Gardner MA. iii. LUCY ANNETTE COOLIDGE, b. 16 Apr 1853, Gardner MA; d. Aft. 1930. 4. LEANDER5 DAVIS (GEORGE WASHINGTON4, SILAS3, ELEAZER2, ELEAZER1) was born 29 Jun 1826 in Gardner MA, and died 01 Nov 1896 in Orange MA. He married JANE E ?. She was born Abt. 1827 in MA, and died Aft. 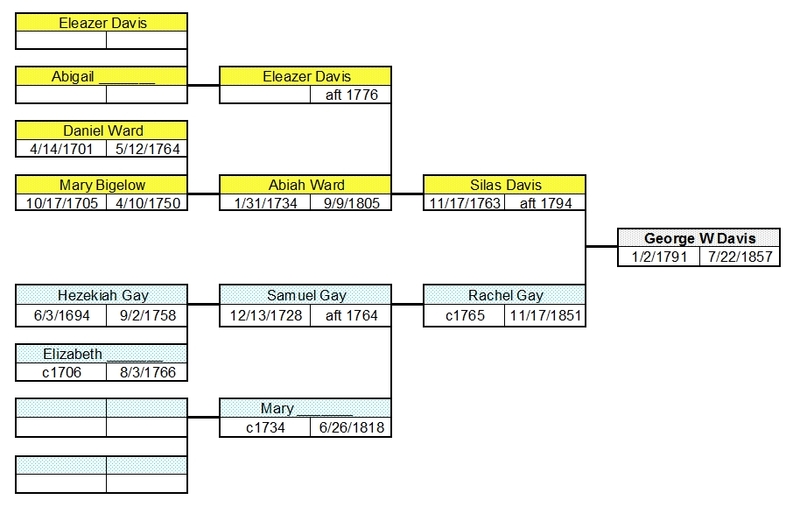 1870.
i. LENA J6 DAVIS, b. Abt. 1848, MA; d. Aft. 1880. 5. ANNA PERLEY5 DAVIS (GEORGE WASHINGTON4, SILAS3, ELEAZER2, ELEAZER1) was born 25 Sep 1827 in Gardner MA, and died 27 Jul 1903 in East Providence RI. She married DEXTER STARKEY 09 Mar 1855 in Gardner MA, son of SAMUEL STARKEY and THANKFUL BOLLES. He was born 02 Feb 1824 in Bethlehem NH, and died Bet. 1885 - 1900.
i. EMMA ISADORE6 STARKEY, b. 06 Sep 1856, Gardner MA. 8. ii. LILLA MARIA STARKEY, b. Abt. 1859, MA; d. 17 Mar 1899, Providence RI. iii. MARY M STARKEY, b. Abt. 1862; d. 12 Aug 1874, Providence RI. 9. iv. ANNA PEARCE STARKEY, b. 08 Aug 1868, NJ; d. Aft. 1930. 10. v. BYRON GILBERT STARKEY, b. Feb 1869, NJ; d. Aft. 1930. 6. WALTER ALONZO6 DAVIS (ALONZO5, GEORGE WASHINGTON4, SILAS3, ELEAZER2, ELEAZER1) was born 13 Jul 1846 in Fitchburg MA, and died Aft. 1920. He married FANNIE ADELIA BOGART 28 Apr 1874 in Fitchburg MA, daughter of CORNELIUS BOGART and SARAH LOVELL. She was born Feb 1849 in West Fitchburg MA, and died 31 May 1907 in Fitchburg MA. i. EDITH LOVELL7 DAVIS, b. Mar 1875, Fitchburg MA; d. Aft. 1940; m. EDWIN CLARKSON SMITH, 19 Apr 1913, Fitchburg MA - later divorced; b. Abt. 1890, MA; d. Aft. 1920. 7. HENRY ALONZO6 COOLIDGE (BETSY5 DAVIS, GEORGE WASHINGTON4, SILAS3, ELEAZER2, ELEAZER1) was born 24 Oct 1848 in Gardner MA, and died Aft. 1930. He married EFFIE A SMITH 23 Jan 1877 in Gardner MA, daughter of LUTHER SMITH and ABBIE EVERETT. She was born 20 Jan 1858 in Sterling MA, and died Bet. 1910 - 1920. 11. i. IDA MARY7 COOLIDGE, b. 08 Sep 1877, Gardner MA; d. Aft. 1930. 12. ii. ADA ANNETTE COOLIDGE, b. 15 Oct 1879, Gardner MA; d. Aft. 1940. 8. LILLA MARIA6 STARKEY (ANNA PERLEY5 DAVIS, GEORGE WASHINGTON4, SILAS3, ELEAZER2, ELEAZER1) was born Abt. 1859 in MA, and died 17 Mar 1899 in Providence RI. She married GEORGE HERBERT ROWE 13 Nov 1880 in Providence RI. He was born May 1852 in RI, and died Aft. 1900.
i. ANNIE MAY7 ROWE, b. 18 May 1881, Providence RI; d. 09 Oct 1899, East Providence RI. ii. MARY LILLIAN ROWE, b. 07 Sep 1883, Providence RI. 13. iii. NETTIE LOUISE ROWE, b. 12 Dec 1885, Providence RI; d. 06 Oct 1946, Cranston RI. iv. SON ROWE, b. 04 Feb 1888, Providence RI; d. 04 Feb 1888, Providence RI. v. ADA FRANCES ROWE, b. 22 Feb 1889, Providence RI; d. Aft. 1910.
vi. GEORGIA BELLE ROWE, b. 23 Feb 1893, Providence RI; d. Aft. 1910. 9. ANNA PEARCE6 STARKEY (ANNA PERLEY5 DAVIS, GEORGE WASHINGTON4, SILAS3, ELEAZER2, ELEAZER1) was born 08 Aug 1868 in NJ, and died Aft. 1930. She married (1) BENJAMIN HENRY PETTIS 08 Sep 1887 in Lincoln/Smithfield RI. He was born Jun 1850 in MA, and died 23 Aug 1901 in Middletown RI. She married (2) ARTHUR H GARDNER 31 Jan 1911 in Nashua NH. He was born Abt. 1858 in Nova Scotia, and died Aft. 1930.
i. BERTHA MAUD7 PETTIS, b. 14 Jan 1889, Providence RI; d. Aft. 1930; m. JAMES B MUIR, 29 Dec 1910, Fall River MA; b. Abt. 1882, RI; d. Aft. 1930.
ii. VERA MARY PETTIS, b. 23 Apr 1891, Providence RI; d. 25 Feb 1894, Providence RI. iii. HENRIETTA PETTIS, b. 03 Aug 1901, Providence RI; d. 26 Jul 1903, East Providence RI. 10. BYRON GILBERT6 STARKEY (ANNA PERLEY5 DAVIS, GEORGE WASHINGTON4, SILAS3, ELEAZER2, ELEAZER1) was born Feb 1869 in NJ, and died Aft. 1930. He married CARRIE ETTA MCMANNS 09 Dec 1892 in Providence RI. She was born Jul 1874 in CT, and died Aft. 1930.
i. BYRON D7 STARKEY, b. 14 Jul 1893, Providence RI; d. Aft. 1910.
ii. RALPH BURTON STARKEY, b. Abt. 1894; d. 08 Dec 1894, Providence RI. 11. IDA MARY7 COOLIDGE (HENRY ALONZO6, BETSY5 DAVIS, GEORGE WASHINGTON4, SILAS3, ELEAZER2, ELEAZER1) was born 08 Sep 1877 in Gardner MA, and died Aft. 1930. She married FRED C MERRITT 30 Oct 1895 in Gardner /Templeton MA, son of CHARLES MERRITT and ELVAH WILDER. He was born 02 Oct 1873 in Templeton MA, and died Aft. 1930.
i. BEULAH M8 MERRITT, b. 10 May 1896, Gardner MA; d. Aft. 1920.
ii. MILDRED HAZEL MERRITT, b. 26 Aug 1898, Gardner MA; d. Aft. 1920.
iii. MARY EVERETT MERRITT, b. 13 Nov 1901, Gardner MA; d. Aft. 1910.
iv. HENRY CHARLES MERRITT, b. 08 Dec 1903, Gardner MA; d. Aft. 1920.
v. CLESSON COOLIDGE MERRITT, b. 10 Nov 1905, Gardner MA; d. Aft. 1930. 12. ADA ANNETTE7 COOLIDGE (HENRY ALONZO6, BETSY5 DAVIS, GEORGE WASHINGTON4, SILAS3, ELEAZER2, ELEAZER1) was born 15 Oct 1879 in Gardner MA, and died Aft. 1940. She married JACOB GEORGE BRITTON 28 Jun 1899 in Gardner MA, son of GEORGE BRITTON and ALICE BAILEY. He was born 12 Sep 1878 in Hinsdale NH, and died Aft. 1942.
i. DORIS ALICE8 BRITTON, b. 15 Mar 1904, Gardner MA; d. Aft. 1940. 13. NETTIE LOUISE7 ROWE (LILLA MARIA6 STARKEY, ANNA PERLEY5 DAVIS, GEORGE WASHINGTON4, SILAS3, ELEAZER2, ELEAZER1) was born 12 Dec 1885 in Providence RI, and died 06 Oct 1946 in Cranston RI. She married JAMES HENRY KELLY 15 Feb 1905 in Providence RI. He was born Abt. 1882 in RI, and died Aft. 1940.
i. JOHN T8 KELLY, b. Abt. 1906, RI; d. Aft. 1920.
ii. JAMES H J KELLY, b. Abt. 1908, RI; d. Aft. 1930.
iii. LILLIAN M KELLY, b. Abt. 1910, RI; d. Aft. 1940.
iv. FRANCIS G KELLY, b. Abt. 1913, RI; d. Aft. 1930.
v. ELIZABETH A KELLY, b. Abt. 1920, RI; d. Aft. 1940.
vi. JOSEPH KELLY, b. Abt. 1922, RI; d. Aft. 1940.
vii. JAMES KELLY, b. Abt. 1925, RI; d. Aft. 1940.